Our process identifies your relevant business needs and provides solid recommendations and a plan to address them — to get the right results. Our process identifies your relevant business needs and provides solid recommendations and a plan to address them— to get the right results. How much do you spend on printing, copying, and distributing documents? You don’t know if an MFP, Laser Printer, Light Production System, or workflow/job automation is what you really need – you just know you need to print, distribute and store high quality documents. You probably don’t even know how many documents you print and copy each year (most companies don’t). All you know is that you have a hodgepodge of equipment from different manufacturers that are a nightmare to manage. Or you’re under contact with an office equipment provider who sold you a solution that was anything but. And the levels of service responsiveness and productivity promises have not come close to being met. As a “bonus,” your business has grown and the “solution” offered hasn’t been flexible enough to meet those new needs – and your service “partner” hasn’t been helpful in addressing those new needs – at least not without another round of negotiations and larger monthly bill. What devices are in your current print fleet? 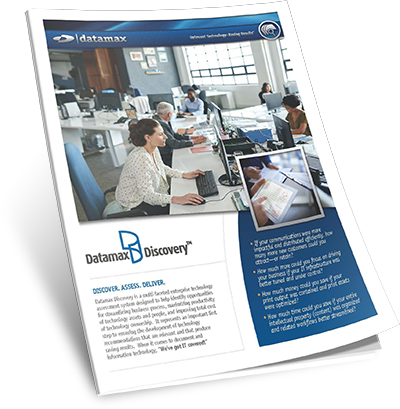 Whether a higher level assessment or an in-depth, comprehensive Print/Workflow Audit, Datamax Arkansas has a proven history of identifying opportunities for productivity and budgetary improvements when it comes to managing and leveraging office equipment and information technology. More efficiency, less expense, greater responsiveness. “Each employee uses $600 to $1,300 of printing costs yearly, much of that printed/copied output is never even used.” An assessment will help you uncover wasteful document output and reduce it through print rules and other methods. Source: GreenPrint Study. 83.6% of ALL equipment service calls were resolved in ONE visit. And our technicians are FAST (yet thorough) – average resolution time is 74 minutes to fix whatever the issue issue. How’s that for responsive service? Source: Datamax Arkansas. If you’re ready to discover a how much you spend on your current printing practices – and opportunities for streamlining document output and lowering costs – contact us for a Print/Workflow Assessment today. An average employee prints $600 to $1,300 worth of documents each year – many of those documents are printed accidentally and immediately thrown away.